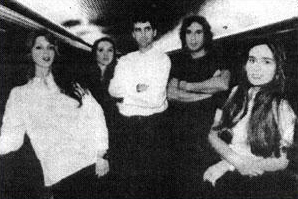 From Left: Karina Chechik, Carolina Sardi, Daniel Fiorda, Pablo Contrisciani and Luciana. Art Center participants in new exhibit. To depart means to leave one's culture, background and history. To arrive is to reach a destination, to carry one's history into a new reality. At ArtCenter/South Florida's new exhibit, Departures Arrivals, five Argentinian artists - Luciana Abait, Karina Checkik, Pablo Contrisciani, Daniel Fiorda and Carolina Sardi - examine the catalysts and tensions of change as they emigrated from their homeland to Miami - providing a glimpse into the psychological and spiritual experiences involved in departure, arrival, and the journey in between. The five artists, who come from various regions and backrounds in Argentina, first met at ArtCenter - which has provided forum for the artists to share their common hopes of new opportunities and shared losses of family and friends left behind. This unique bond ultimately developed into Departures Arrivals, an opportunity for the artists to express their individual, yet common feelings and thoughts on the theme. "Art makes people dream, wonder, think, reflect about life and reality~ our existence, our being, who we were, are, and will be," says Luciana Abait, one of the five artists. "The project entices people to think, recall and relate to the conceptual ideas that are part of any traveling experience," she explains. "We all must leave one day, either for a day or for years. There is much more to moving on than than the act itself. That is what we are challenging the viewers to think of." The exhibit's concepts, says ArtCenter Executive Director Gary Knight, are especially germane to the artistic and cultural influx into our ever-changing city "Since Miami has become a home for so many people from so many different places and representing so many ultures," he says, "we seriously believe that the exhibit will promote ii engaging dialogue with the community"
"Departure is to go away from our origins and our history, to turn aside from our people and from their floods of influences, to be ready for change. Arrival is to reach a destination, to carry our history and to become a part of a new reality, to put together past, resent, and future, to attain success." From this original idea evolved a poignantly personal and analytical project that weaves their original interpretations into a common theme. Luciana Abait's piece, four large format paintings with three-dimensional use of metal, symbolizes a journey. Chairs, representing people, advance from the red canvas to the blue and black one and back. The departure is a narrow passage, something that forces a person to leave. The arrival portion of her piece is an open space with infinite possibilities - a game that can be played over and over. A pair of dice indicates the player's fate, which are altered by a set of rules, based on the artist's reflections about the cyclical nature of life. Karina Chechik's format extends to give continuity to the pictorial aspect of the exhibition. Two vertical panels of images of railroads and urban landscapes are painted over written text by Jorge Luis Borges, mirroring her ~ersonal experience. Her feelings about her journeys are best represented by this quote from Borges: "He who moves away from his house has already returned." Pablo Contrisciani sees departures-arrivals as dialectic concepts, combining to create infinite journey. A large horizontal canvas with formal elements of color and composition suggest and reinforce opposition between the two polar ideas. Influenced by Pop and Op Art, Pablo's choice of strong, contrasting colors symbolizes emotions n an almost shocking manner. Daniel Fiorda approaches the departure-arrival theme in a more conceptual way, creating an installation with an old, bi-sected car formin identical vertical pieces. The two pieces, covered in a metallic skin, symbolize the passage of time. Carolina Sardi's work is strongly influenced by her relationships: her sculptural objects represent affections that are broken or displaced by travel. This rupture is symbolized by the arrangement of pieces that follow the silhouette of an airplane, indicating different people, places, and relationships. The exhibit, which is being shown at ArtCenter/So~uth Florida's Lincoln Road Gallery at 800 Lincoln Road, also includes a collaboratively-produced video in which the artists express their thoughts on departures-arrivals. References to airports, such as signs, information telephones (telephones programmed with on-going messages recorded by the artists), as well special lighting effects and security cameras create an atirlosphere that transports the public into place where any journey can end - or begin. A panel discussion, "Departure Art vs. Arrival Art," on Thursday, April 22, will feature Channel 10 news analyst Michael Putney; Carol Damien, Chair, FIU Visual Arts Department; Francine Bir-bragher, Miami editor of Art Nexus and an art historian; Richard Shack, Chairman of the Board, ArtCenter/South Florida; and Richard Paul Lose, poet and art critic. The discussion will be held at 7 p.m.,at ArtCenter/South Floridis 924 Lincoln Road Gallery, #200.